In 2018 Optima became preferred suppliers to the University of Nottingham – a member of the prestigious Russell Group of universities. We are commissioned to work on creative concept projects, plus design and typesetting for specialist priority projects spanning both print and digital. 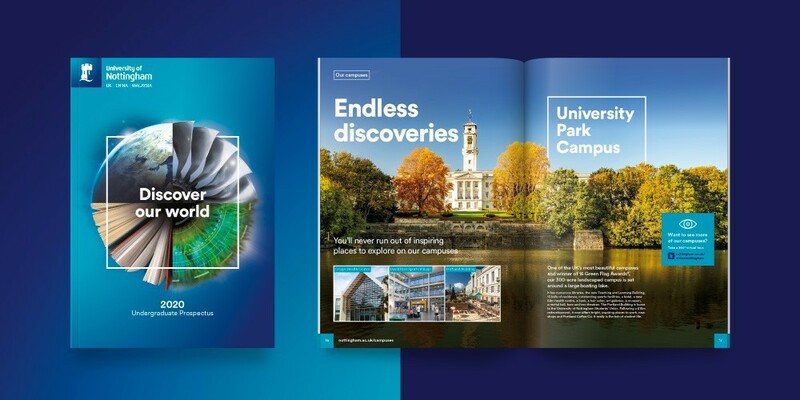 In 2018 we tendered, costed and won the project to design the University of Nottingham’s flagship publication – the Undergraduate Prospectus 2020 which now sits proudly in locations across the world and on the university’s website. 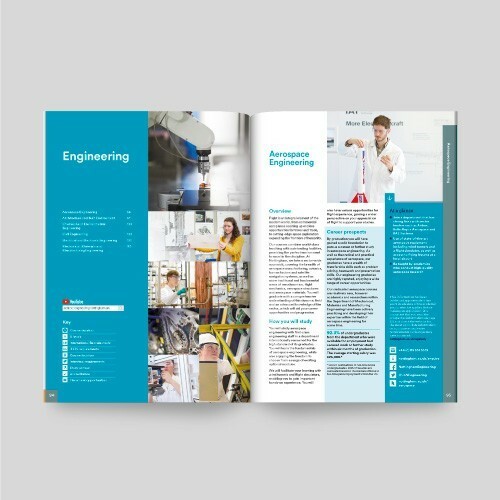 This prospectus is the last edition in their already established three year creative strategy for their recruitment publications, therefore the overarching design needed to be a sympathetic evolution from the previous year. Our creative for the cover won the favour of the student vote, which we refined with the University’s External Relations team to achieve the agreed design. 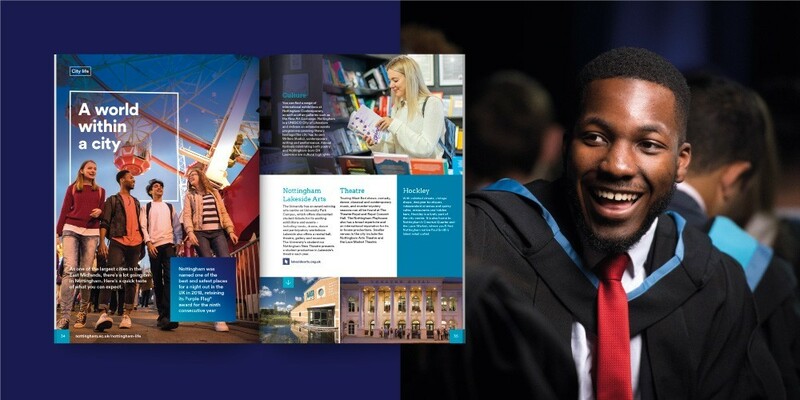 The underpinning message is ‘Discover our world’ - an invitation to potential applicants, school leavers and their parents/guardians to discover the world of the University of Nottingham ….and beyond. Bold evocative photography of vibrant Nottingham, the University’s stunning campuses across the globe and positive, relatable student imagery create a strong sense of the University experience. Typography is driven by the brand fonts and used to reinforce the hierarchy of messaging and facilitate the volume of content within the course sections. 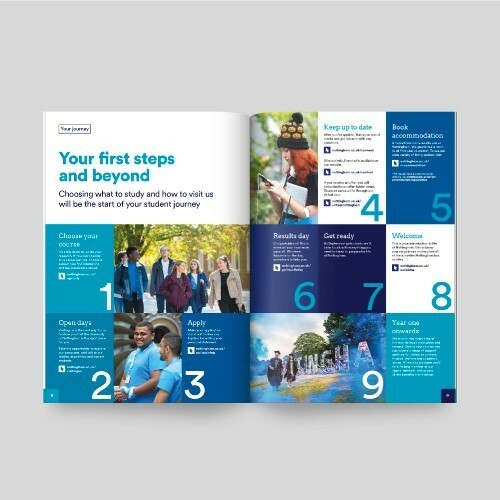 The colour palette is comprised of the university's suite of blues and complementary faculty colours which work as divider pages and a wayfinding device for the 224 page publication. Accessibility of the prospectus is of utmost importance and a particular focus for the University. Significant time spent planning and technically setting up the document up from the outset resulted in a much improved, highly accessible pdf that works in speaking browsers. In practice this meant designing in a way that ensures browsers read the content in the right order. As a time sensitive publication, this needed to be printed and available for use at the first UCAS fairs of the year, which required robust planning and excellent communication. Optima drew up a schedule including key milestones from planning all the way through to the press-pass. The result being that the project was completed on time, on brand…and on budget! Work with the University of Nottingham continues apace on a broad range of projects including websites, celebration videos, digital campaign assets, event identities and building wraps.